Alia & Ranveer Leave Everyone *Starstruck* At The ICW Finale! The Taj Palace hotel in New Delhi was transformed into a Bollywood set for ace designer, Manish Malhotra’s couture collection, ‘Sensual Affair’. Bright silver lights, the sound of wind chimes and models dressed in sparkly outfits transported the audience into a dreamland of glitz and glamour. 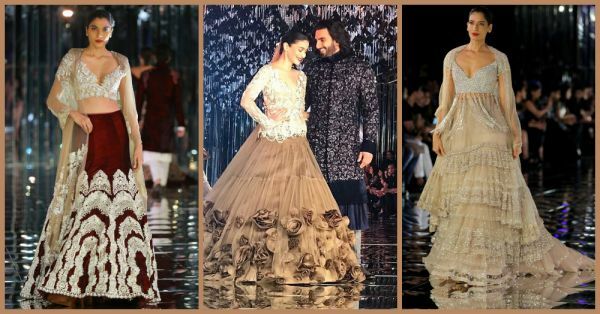 While the collection truly was mesmerizing, it was the showstoppers, Ranveer Singh and Alia Bhatt who left us awestruck! And we have to say, their chemistry on the ramp was just too cute! It was almost impossible to take our eyes off Alia as she took the ramp in a stunning outfit complete with crystals, rose ruffles and an endless trail. So gorgeous! Ranveer Singh, who is known for his dramatic entries, did not disappoint this time either! Flaunting his Alaunddin Khilji avatar, he walked the ramp while blowing flying kisses to the guests. A navy blue sherwani with some rather beautiful detailing gave him that royal look. The designer with his gorgeous showstoppers! What a stunning team they make! Needless to say, the rest of the collection was just as gorgeous. Here, take a look. Wish you could get your hands on one of these? Yeah, our thoughts are just the same!